A Grand Auditorium body, Venetian cutaway, and the Taylor Expression System add up to a versatile guitar that's perfect for both stage and home. Crisp, black binding flanks the satin-finish sapele back and sides and glossy Sitka spruce top, and then continues up the fretboard. The 314ce is truly a performer's workhorse, combining technology and craftsmanship with understated style. Features: 6-String Grand Auditorium with Venetian cutaway Better amplification with the Taylor Expression System Sitka Spruce top Sapele back and sides Ebony fretboard and bridge Tusq nut and saddle Chrome-plated Taylor tuners Adjustable truss rode Strung with Elixir Light Gauge Strings with NANOWEB Coating Taylor's Grand Auditorium Shape The Grand Auditorium was the first guitar shape designed from scratch by Bob Taylor. It was unveiled to commemorate the company's 20th Anniversary in 1994, and since then it has more than lived up to its promise. Although the GA has the width and depth of a Dreadnought, its narrower waist gives it the appearance of a smaller instrument, adds treble "zing" across the guitars tonal spectrum, sharpens the definition of individual notes, and also enables it to rest comfortably in the lap. Because Taylor removed mass from the width of the GAs braces, the guitar top moves faster, resulting in a snappy, bell-like tone. The GA is designed to be a strong fingerpicking guitar that also can handle medium strumming, and is exceptionally versatile. A Venitian cutaway in the 314ce Grand Auditorium body allows better access to the upper frets. 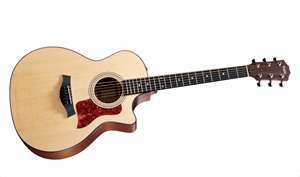 In the past, many players moving to acoustic guitars grew accustomed to the cutaways on their electric guitars, while others simply like the freedom of movement into the upper register that a cutaway allows. Now, cutaways are favored as much for their decorative appeal as for their function. Solid sitka spruce top is joined with sapele sides and back for a crisp and bright sound. Rings Bright and Clear The top is made from Sitka Spruce, a dense, straight-grained wood that has the highest strength and elasticity-to-weight ratio among available tonewoods. It's these attributes that make Sitka Spruce an ideal material not only for soundboards, but also for internal bracing. The Sitka top will produce a tone slightly brighter tone than Engelmann Spruce. The back and sides of the 314ce are made from the mahogany-like sapele wood, which has gained a legion of fans ever since Taylor introduced it in 1998. As a tonewood, it's denser and harder than mahogany, so it has a crisper, clearer, brighter, "pop"-ier sound than its more familiar counterpart. Loud and robust, with a lovely ribboned grain, sapele has been used by Spanish guitar makers for many years. The Taylor Expression System gives you a natural acoustic sound. Pure Reproduction of An Acoustic Sound In the past, Taylor had relied on after-market pickups that employed traditional piezo technology. But the result was a distorted tone that failed to capture the natural acoustic richness and dynamics of a Taylor for live performance. After several years of research, Taylor designed their own groundbreaking pickup system that uses magnetics much like a microphone. The result is an exceptionally pure reproduction of an acoustic guitars natural sound. The Taylor Expression System delivers an amplified tone that will satisfy the most demanding pro player, yet makes it simple for anyone to plug in and sound great. The Expression System incorporates three different magnetic sensors. Two strategically placed Dynamic Body Sensors affixed to the underside of the soundboard capture the complex nuances of the tops vibration, while a Dynamic String Sensor mounted beneath the fretboard extension registers string and neck vibration. The preamp boosts the pickup signal cleanly, without the need for artificial EQ "coloration." The balanced, low-impedance signal the Expression System produces can run direct into a mixer or PA in most situations, and is free of distortion at almost any volume. Three simple, unintrusive onboard control knobs preserve the aesthetic beauty of your Taylor, yet allow you to easily adjust the volume, bass, and treble to suit your personal preferences and performance environment. When set flat, the tone controls add no color and produce the most natural sound. Or, add bass or treble (or subtract) to adjust for the room or personal tastes. The payoff is in the purity of high-fidelity amplified tone, unprecedented dynamic range, and extraordinary resistance to feedback and distortion. It enables all of the expressive subtleties of your playing to come through, just the way you intended. Construction Taylor takes pride in using the finest quality woods for their guitars, like ebony for every fretboard they make. The tone woods for the 314ce were quartersawn and carefully book-matched before being sorted, dried, and prepared by Bob Taylor and his experienced team of luthiers. The 314ce pearl inlay and binding work was also done by hand, providing care and "touch" that no machine can give. Taylor believes that precision matters, which is why they rely on laser cutters and computer-aided milling machines to consistently hit minute tolerances that were impossible a decade ago. Balance and Bracing A balanced tone is critical to a quality recorded sound. Guitars that are too heavily weighted towards a particular end of the tonal spectrum (too "bassy," for example) tend to be tougher to record. While the Dreadnought shape has more volume or bass than other shapes, the overall balance on the 314ce is not compromised. Features large pearl dot inlays. Straight Necks Matter Don't all guitars have straight necks? The answer is usually yes, but the real question is will they stay that way? Since its inception, the acoustic guitar had a major design flaw. The fretboard lacked sufficient support to remain truly straight because of top movement caused by changes in humidity. All guitars experience this phenomenon--often resulting in a slight bump at the 14th fret--but not all guitars respond to it in the same way. Introduced in 1999 and a standard feature since 2001, the patented New Technology (NT) neck was designed by Bob Taylor and his team to accomplish the primary goal of building a straighter, more stable guitar neck. While some necks may bend in the face of humidity and other factors, the NT Neck stays stable and straight. Adjustability is another major NT advantage. Since the NT Neck angle is created by spacers and requires no glue, adjustment simply requires a repair person with a new set of spacers and about five spare minutes. Altering the neck angle of a traditional neck assembly could require invasive surgery to remove wood and relocate the bridge. The bottom line: The NT Neck on the 314ce means a stable, easy-to-adjust neck that stands up to the pressures all acoustic guitars face. Tuners Precise, gleaming tuners add appealing form to an important function, while the type of strings used can alter the feel and the tone of your guitar. Taylor pays careful attention to both, using tuners and strings that are optimized for the 314ce guitar. Together, they are among the keys to an easy-playing, incredible-sounding Taylor.